An tÚasal, Samura Kamara, Aire an Roinn Gnothaí Eachtracha, a shoilsigh, na hAirí Oifigigh, Teachta Dála, a chairde Gael, a dhaoine uaisle. Tá fáilte romhaibh go leir anseo anocht agus Lá Fheile Padraig Shona daoibh. The Honourable Samura Kamara, Minister of Foreign Affairs and International Cooperation, Honourable Ministers, Honourable Members of Parliament, your Excellencies, distinguished guests, ladies and gentlemen. You are very welcome here this evening and I wish you a Happy St. Patrick’s day. I would like to thank Honourable Minister Kamara, for taking time from his busy schedule to be here with us to celebrate our national day. Let me also thank the excellent Ballanta singers for such a terrific rendition of the Irish national anthem, not easy! Let me start by recognising why today is such an important day for Sierra Leone. Today Sierra Leone and the region, once again, declare the end of the devastating Ebola outbreak, hopefully this time for the last time. We are all aware of the losses borne by the Sierra Leonean people during the Ebola outbreak, so I will not dwell on that tonight, but I think it is fitting that we offer a moment’s silence to remember those who lost their lives. Sierra Leone and Ireland have a lot in common. Our countries are almost exactly the same size, we share many common values such as the importance of the family, and we are both colonized by Britain. Now of course I am not going to give the British High Commissioner a hard time tonight for the 800 years of oppression that Ireland suffered, I would never do that! My point is just that Sierra Leoneans understand what it means to struggle for and gain independence. Not so? But seriously, 2016 is a very important year for Irish people, as it marks the centenary of the 1916 Easter Rising, which was an important moment in Ireland’s movement towards independence. The Proclamation of Independence, which was posted across my home town of Dublin on the morning of Easter Monday 1916, aspired to an Irish Republic that “guarantees religious and civil liberty, equal rights and equal opportunities to all its citizens, and declares its resolve to pursue the happiness and prosperity of the whole nation and of all its parts, cherishing all of the children of the nation equally…”. 100 years later, I think those words continue to guide us, not just in terms of the Ireland that we aspire to, but also in terms of our contribution to international development through Irish Aid. Speaking of significant anniversaries, as you all know, we did not celebrate St. Patrick’s Day last year because of the Ebola crisis. This means that I did not get a chance to tell you that 2015 was the 10 year anniversary of the Irish government’s presence in Sierra Leone. Of course, we all know that the Irish Government is the new kid on the block in terms of the broader Irish presence in Sierra Leone. Let’s take the St Joseph’s of Cluny congregation, for example, with sisters like Sister Mary Sweeney in Makeni and Sister Teresa McKeon in Kono, both making huge contributions to the education sector. These sisters are celebrating 150 years in Sierra Leone this year. Sister Teresa herself is celebrating 62 years in Sierra Leone this year. So it’s hard to compete! But I am sure you are all familiar with the concept that to see far, it is recommended to stand on the shoulders of giants! So building on these many years of work of the Irish missionaries and NGOs such as Goal, Concern and Trocaire, the Irish Government set up an office in Sierra Leone in 2005. What have we achieved since then? I will mention four areas. Firstly, in terms of our broader relationship with Sierra Leone, we upgraded to a full Embassy in 2014 and now provide consular services to Irish citizens and visa services to Sierra Leoneans. In the area of consular services, I would like to warmly thank Dr. Wadi Aboud, our former Honorary Consul General for all the work he did providing consular services since 1977 until the Embassy took over consular services in 2014. Secondly, we have built up our development cooperation programme to become one of Irish Aid’s 8 top priority countries worldwide in 2013. I am sure that this is due to the excellent relationship we have with the Sierra Leonean government and due to the strong work of our partners. The work carried out in Ireland for the last 25 years by the Sierra Leone Ireland Partnership group is also a key contribution in strengthening the relationship between our two countries. What’s more, the developing country representative on the Irish Aid global advisory panel is a Sierra Leonean since 2014, Mr. Herbert McLeod who is here with us tonight. Irish Aid has invested over €100m in Sierra Leone since 2005, largely in the areas of health, nutrition, gender and governance. Through this funding, along with policy engagement and technical support, we continue to focus on our two main areas— food and women. In terms of Irish Aid’s work on food, we continue to work closely with the Ministries of Health and Agriculture, and the SUN secretariat in the Vice-President’s Office to improve nutrition and food security. Despite huge efforts in this area, two in every five Sierra Leonean children still fail to reach their full physical and mental potential in life due to malnutrition before they reach the age of two. Together with the government, UN and NGO partners, we are fighting against this scourge of what we call ‘stunting’. This will require even greater efforts, particularly in terms of moving beyond rice, beloved though rice is in Sierra Leone, in order that Sierra Leoneans grow and eat more diverse crops to ensure that these children get the nourishment they need to reach their potential and contribute to their families, society and the economy. In terms of our second area of women and girls’ rights, a major focus for us for several years has been the prevention of teenage pregnancy. One in three Sierra Leonean children are born to other children. This trend has got to stop because of the huge implications on maternal mortality, as well as the opportunities being lost to the next generation of Sierra Leonean children. In terms of boosting these opportunities, a key priority for Irish Aid over the past year has been ensuring that pregnant girls remain in the education system. Working with the Ministries of Education, Health and Social Welfare, as well as DfID, UNFPA and UNICEF, we are supporting 8,918 pregnant girls for formal education, as well as health and counselling services. I would like to commend the Government of Sierra Leone for the excellent progress made in this area, and we look forward to tackling the outstanding challenges, such as pregnant girls returning to mainstream schools and sitting state exams. Speaking of education, the third achievement I wanted to mention to you all this evening in terms of our first 10 years in Sierra Leone is our fellowship programme. 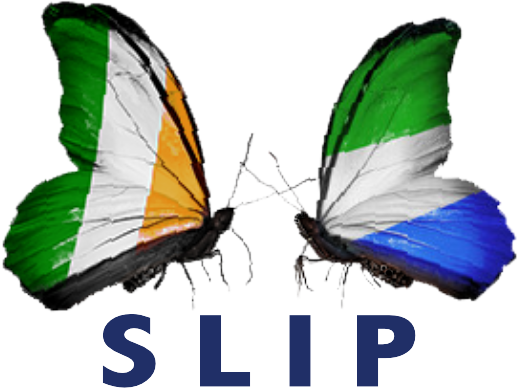 Through the Irish Aid fellowship programme that we launched in 2013, Sierra Leoneans now have an opportunity to pursue masters’ degrees and post-graduate diplomas in Ireland. I am delighted to see some of the graduates present this evening. We look forward to this fellowship programme becoming one of the strong pillars of the relationship between Ireland and Sierra Leone. Finally, the fourth achievement we have made since our office opened in 2005 relates to the support that we can now give to Irish-funded NGOs, missionaries and Irish companies who are all contributing to making Sierra Leone a better place in different ways. One example of this is our work with Government and NGOs to ensure that the Government’s new NGO Policy maximizes the benefit of what NGOs can contribute to Sierra Leone, while assisting Government to make sure that this support is as coordinated as possible. We are currently drawing up a new strategy for our engagement over the coming years. The bottom line is that you can expect more Ireland in Sierra Leone, and I think we can all agree, as we stand here to celebrate St. Patrick’s Day, that this can only be a good thing! Finally let me thank all of you for joining our celebration this evening and for all your excellent collaboration during the year. And let me thank our staff this evening for doing such a terrific job, particularly our Administrator Davida MacAuley who runs this show. It remains for me to ask you to raise your glasses to toast the President of Sierra Leone, Dr. Ernest Bai Koroma and the enduring partnership and friendship between the people of Ireland and the people of Sierra Leone. As we say in Ireland , Slainte.